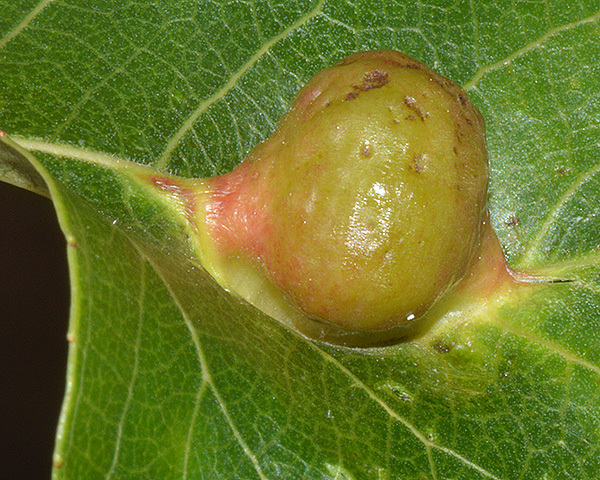 In spring, the fundatrices of Pemphigus populinigrae induce yellowish or dull reddish broad pouch-shaped galls (see first picture below), on the midrib of the upperside of leaves of poplar (mainly Populus nigra). Mature galls are rounded and smooth on top and are sometimes partially subdivided. (cf. Pemphigus gairi and Pemphigus phenax which induce reddish elongate galls often tinged with yellow laterally). The galls of Pemphigus populinigrae are usually located near the middle of the leaf and open on the underside of the leaf. The fundatrices (not pictured) are green or greyish green, and have no siphunculi. They have 4-segmented antennae which are about 0.17 times the length of the body. The winged migrants (see second picture above) from the primary host are dark green with a slight covering of powdery wax. 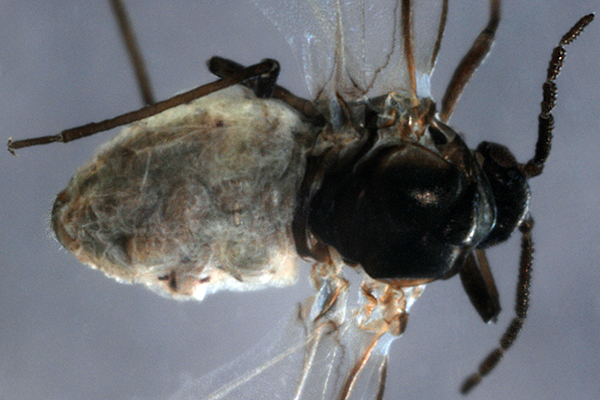 Along the upper surface of the abdomen there are six rows of more-or-less fused wax-glands. The six segmented antennae of the emigrant alatae (see pictures below) are about 0.3-0.4 times the length of the body, with a rather indistinct terminal process. Secondary rhinaria extend almost to the base of the third antennal segment, so that the small "tooth" on the inner side is distal to the most basal rhinarium. The third antenal segment has 12-18 secondary rhinaria, the fourth has 3-7 secondary rhinaria, the fifth has 4-7 secondary rhinaria, and the sixth has 4-7 secondary rhinaria (cf.Pemphigus populi whose alatae have no secondary rhinaria on antennal segment VI). There is no brown shadowing around the wing veins. Siphunculi are present but small and indistinct. Alatae of Pemphigus populinigrae emerge from the galls on poplar in June-August and migrate to found colonies above ground on the stems, leaves and flowers of cudweeds (Filago, Gnaphalium). Apterae on the secondary hosts are yellow-green, with white wax-wool. The adult body length is 2.0-2.2 mm. 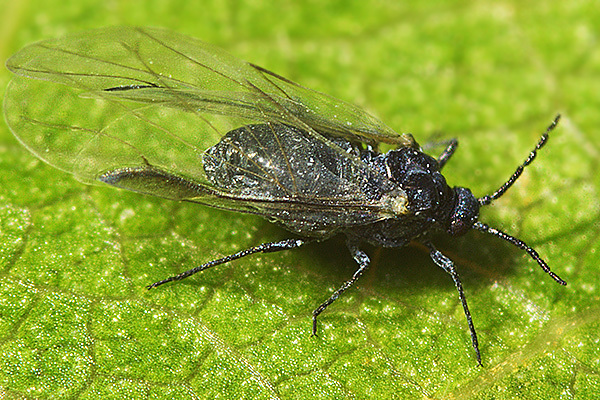 sexuparae return in September-October to black poplar where the female oviparae lay overwintering eggs. Pemphigus populinigrae is found throughout Europe and across Asia to east Siberia. The picture below shows the opening of the gall of Pemphigus populinigrae on the underside of the leaf. 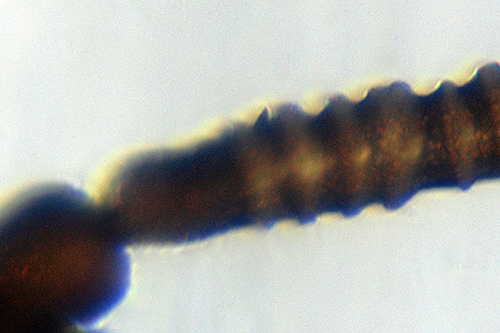 The first picture below shows a fourth instar emigrant alate of Pemphigus populinigrae . 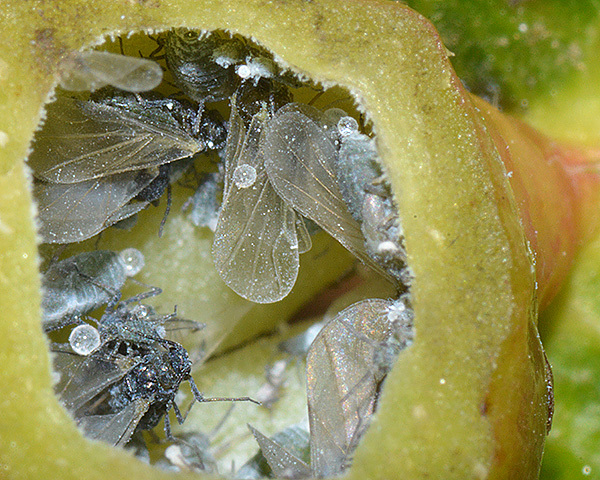 The second picture shows a group of emigrant alates and immatures inside the gall. Note in both the above pictures the wax-covered globules of honeydew. 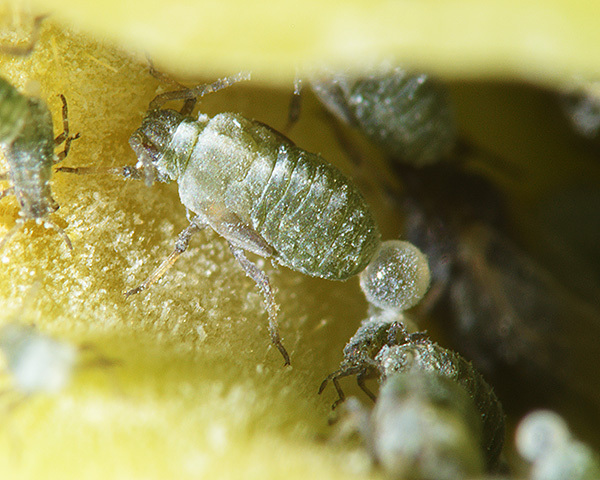 The wax coating on the honeydew droplets prevents the honeydew from fouling the alates. 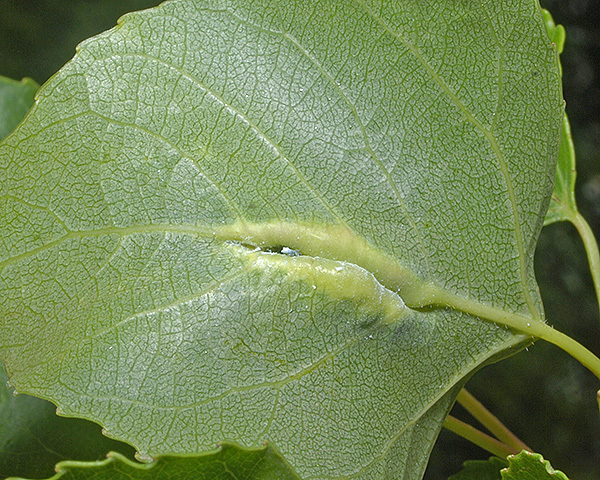 Pemphigus populinigrae has been recorded from at least 6 Populus species. Blackman & Eastop list 41 species of aphid as feeding on Black, or Lombardy poplar (Populus nigra) worldwide, and provide formal identification keys. Of those aphid species, Baker (2015) lists 17 as occurring in Britain: Aulacorthum solani, Chaitophorus leucomelas, Chaitophorus populeti, Chaitophorus populialbae, Pemphigus bursarius, Pemphigus gairi, Pemphigus phenax, Pemphigus populi, Pemphigus populinigrae, Pemphigus protospirae, Pemphigus spyrothecae, Phloeomyzus passerinii, Pterocomma populeum, Pterocomma tremulae, Stomaphis longirostris, Thecabius affinis, Thecabius lysimachiae and Tuberolachnus salignus. Pemphigus populinigrae has been recorded from 4 Filago species (Filago arvensis, Filago lutescens, Filago pyramidata, Filago vulgaris). Blackman & Eastop list 5 species of aphid as feeding on common cudweed (Filago vulgaris) worldwide, and provide formal identification keys. Of those aphid species, Baker (2015) lists 4 as occurring in Britain: Aphis frangulae, Brachycaudus cardui, Brachycaudus helichrysi and Pemphigus populinigrae. Pemphigus populinigrae has been recorded from 3 Gnaphalium species (Gnaphalium erectum, Gnaphalium sylvaticum, Gnaphalium uliginosum). Blackman & Eastop list 6 species of aphid as feeding on marsh cudweed (Gnaphalium uliginosum) worldwide, and provide formal identification keys. Of those aphid species, Baker (2015) lists 5 as occurring in Britain: Aphis nasturtii, Aulacorthum solani, Brachycaudus helichrysi Myzus ornatus, and Pemphigus populinigrae.